Chicken Tikka Masala wrapped in a middle eastern flatbread sandwich called a ‘saj’. Can we take a moment to appreciate all of the new cuisine that has come to Downtown St Pete recently? Over the past few years, Iberian Rooster introduced us to Portuguese fusion, 11 Chicks brought us Venezuelan, Renzo’s specializes in Argentine asado, and Avocado Valley serves Middle Eastern fare. By the end of February, a Puerto Rican eatery named WEPA! will open. And in late 2019, Baba, a Greek-Lebanese restaurant and bakery from the owners of Bodega will join the Grand Central District. But perhaps most exciting is the introduction of Indian cuisine in the EDGE District. 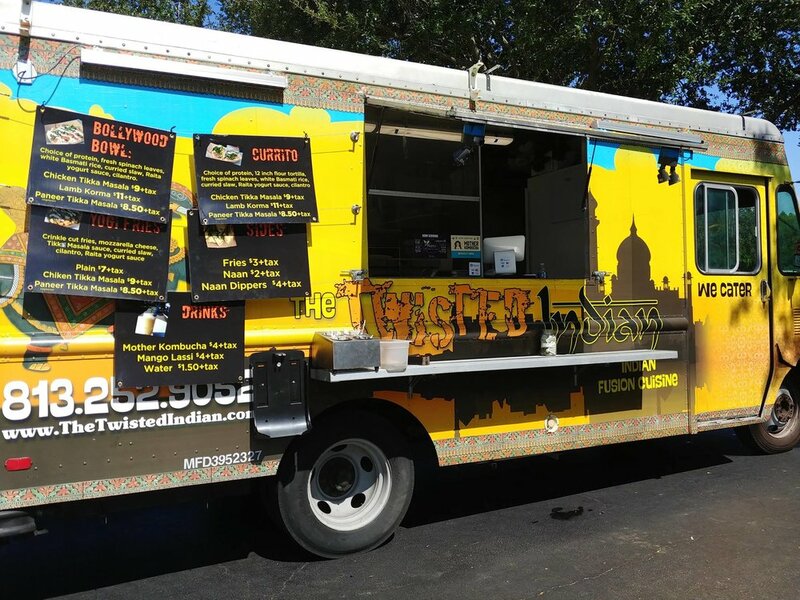 For the past four years, Lokesh Vale has operated The Twisted Indian, one of the most popular food trucks in St. Petersburg. Over the years, the truck has gained a loyal following and become a staple of the Saturday Morning Market and Localtopia. Baum avenue market - a multi-concept space showcasing local makers of fresh fare. Located at 1113 Central Ave.
Today marks the next step in The Twisted Indian’s journey as Vale pulls back the curtain on a new pop-up storefront located at 1113 Central Avenue inside Baum Avenue Market (or BAM for short), a multi-concept space showcasing local makers of fresh fare. At long last, we no longer need to wait until Saturday to enjoy The Twisted Indian’s delicious food. Similar to the food truck, the menu at The Twisted Indian’s new location consists of four proteins prepared in one of three ways — in tacos, a rice bowl, or a Middle-Eastern flatbread sandwich called a saj. Proteins include chicken, paneer (an Indian cheese), and tofu tikka masala and seitan korma. The tacos and rice bowl also come with chickpea curried slaw, and white Basmati rice drizzled with a Raita sauce. Indian cuisine is scarce in Downtown St. Pete, so don’t be embarrassed if you’re unfamiliar with terminology like ‘tikka masala’ or ‘korma'. Tikka masala is a creamy spiced tomato curry sauce cooked with coriander, lemon, and Indian spices, whereas korma is a milder yogurt or coconut milk-based curry sauce with an array of Indian spices. Don’t let the jargon deter you though — everything at the Twisted Indian is very approachable and absolutely delicious. For dessert, The Twisted Indian will have mango lassi, which is a blend of mango, yogurt, milk, sugar and cardamom. Vale may also introduce a cardamom chia seed pudding and/or golden milk, but neither will be available during the soft open. For another dessert option, check out Valhalla Bakery, also located at Baum Avenue Market, which specializes in vegan baked goods. After a soft opening, the plan is to expand the menu beyond what has ever been offered on the food truck. There are a number of chicken, lamb, and vegetarian recipes that Vale is currently working on. Also, be on the lookup for seasonal specials featuring other Baum Avenue Market concepts — such as a Paneer Tikka Masala Pie in collaboration with Valhalla Bakery. The opening of The Twisted Indian’s brick and mortar space has been a lifelong dream for Vale. He was born and raised in Mumbai, India where he developed a fascination for cooking around the 7th grade. “One day in the kitchen, I saw my dad chop up a carrot really fast. And I thought that was really cool,” laughs Vale. After high school, Vale moved to Goa, India where he earned a Bachelors Degree in Hospitality and Hotel Administration. His dream was to enroll in the Culinary Institute of America (CIA), but he knew he didn’t have the resume yet, having never worked in a commercial kitchen. Fortunately, Vale was hired by the Four Seasons in Mumbai, where he worked for three years before being accepted into the CIA in Hyde Park, New York. While in culinary school, Vale would travel to New York City on the weekends and knock on restaurant doors asking if they needed help in the kitchen. And believe it or not, many of New York’s finest restaurants took him up on the offer. For a day or two at a time, he helped out in the kitchen of WD-50 and Junoon, both 1-star Michelin restaurants. Best of all, he even had the pleasure of working at Eric Ripert’s Le Bernardin, a 3-star Michelin restaurant, for a night. After completing his training at the CIA, Vale moved to Washington D.C. to once again work at the Four Seasons hotel — this time at Michael Mina’s Bourbon Steak. A year and a half later, Vale moved down to Tampa Bay to open his own concept. With little investment, a food truck seemed like the way to go. First, he debuted The Twisted Iron and shortly thereafter introduced The Twisted Indian. 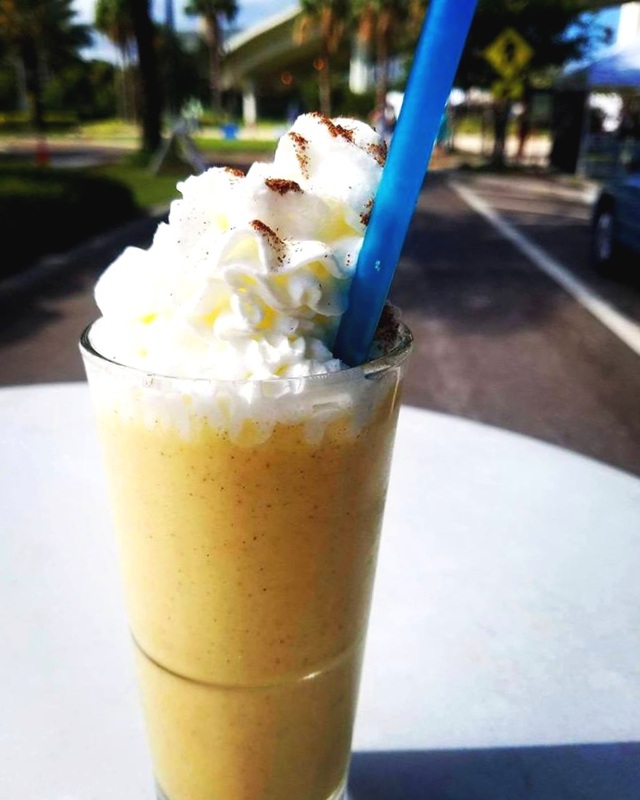 Then three years ago, a big opportunity presented itself — The Twisted Indian was offered a spot at Downtown St. Pete’s Saturday Morning Market. With over 10,000 visitors every Saturday, the market is the largest of its kind in the southeastern United States. After selling out nearly every week for the past two years, Vale knew it was time for The Twisted Indian to grow beyond the food truck. Be sure to visit The Twisted Indian’s new location in the heart of the EDGE District at 1113 Central Avenue inside Baum Avenue Market. Soft open hours will be 11am-4pm Tuesday-Wednesday, 11am-10pm Thursday-Saturday and 11am-4pm Sunday. Follow The Twisted Indian on Facebook and Instagram to stay up-to-date on the latest news and specials.